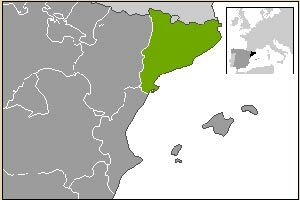 Catalonia (Aranese Occitan: Catalonha; Catalan: Catalunya; Spanish: Cataluña), is an Autonomous Community in the Kingdom of Spain. The Autonomous Community of Catalonia covers an area of 32,114 km² with an official population of 7,134,697 (2006) from which immigrants represent an estimated 12.3% of the total population. It borders France and Andorra to the north, Aragon to the west, Valencia to the south, and the Mediterranean Sea to the east (580 km coastline). Official languages are Catalan, Spanish, and Aranese. The capital city is Barcelona. It is divided into four provinces: Barcelona, Girona, Lleida, and Tarragona. Its territory corresponds to most of the historical territory of the former Principality of Catalonia. Search information about: Weather, Transport, Tourism Schools, Hotel Groups, Fairs, Travel Agencies and more. Apartment Passeig De Gracia Barcelona I Apartment Passeig De Gracia Barcelona II Apartment Passeig De Gracia Barcelona III Urbany Hostel BCN GO! Apartment Mallorca Apartment Torrents de les Flors Old Town Apartments Apartment Avinguda Paral.lel, 204. Apartment Les Corts De Pere Flat In Barcelona Apartment in Olivera St.